With its broken-in feel and relaxed fit, the Petrolicious tee is perfect for a Sunday morning drive, working on the car, or relaxing in between. 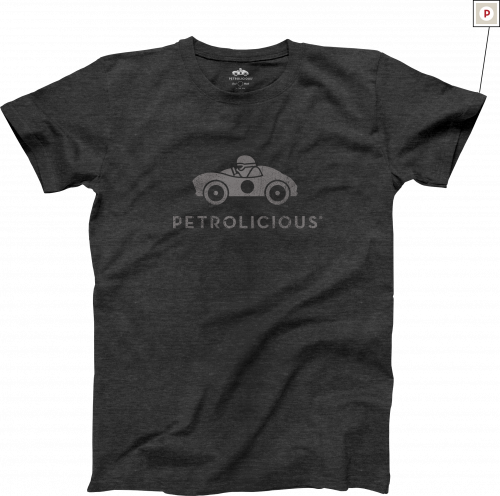 The tee comes in two timeless colors and with the Petrolicious logo proudly emblazoned across the chest. It’s the go-to T-shirt for effortless style. Note: Actual color and graphic size may vary slightly. 50/50 Blend Cotton / Polyester – Made in the USA. In keeping with our standards for quality, we only carry T-shirts with a superior fit, feel, and an extra soft hand. Our designs are printed using a soft-ink process that is long lasting and doesn’t feel heavy­–so your T-shirt stays at the top of your rotation for years to come. T-shirts have a vintage look and feel, pick-stitch detailing, and are have a tagless neck for superior comfort.